Ford’s Boss 429, Blue Crescent, Shotgun Motor, Twisted Hemi, call it what you like. Many people are calling it a stone. Going in we decided to discard all the poor reports we had received on the Boss 429 engine and try to approach it from a fair and impartial standpoint, to give the engine, and Ford, an even chance. 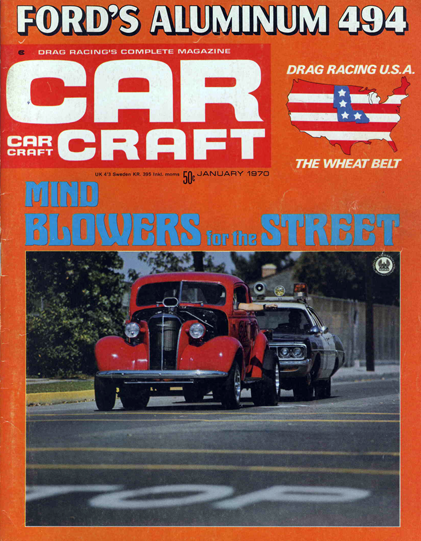 In the following pages we have evaluated the Boss 429 from four different standpoints: as a totally stock “out of the box” showroom new product; as a slightly modified street and strip dual purpose performer; in several all-out fully drag strip-prepared cars; and, finally, on Crane Engineering’s dynamometer. In addition, for your edification, we are including the big inch aluminum block offshoot of the Boss 429, the 494. After conducting the four-pronged test we have concluded, as have others, that the Boss 429 engine fails in its present form when applied to the street performance situation. While the engine may be dominating the NASCAR Grand National Stock Car circuit down south, it seems to lack when tested on the drag strip. Although an industrious few – like Dave Lyall, Wayne Gapp, and the guys at Foulger Ford – have made semi-respectable showings with the engine, the Boss 429, to date, is a loser in the drag car bailiwick. The purpose of the text that follows is to tell you the reasons the Boss 429 has fared and failed, and to suggest how the situation, which is a lot bigger than the Boss 429, might be alleviated. The answer, lies in Ford Motor Company’s approach to the whole performance car market. Originally, the Boss 429 was developed with NASCAR (Grand National Stock Car) racing as the primary application, but as with the SOHC Ford engine, a secondary outlet for the equipment was found in drag racing. 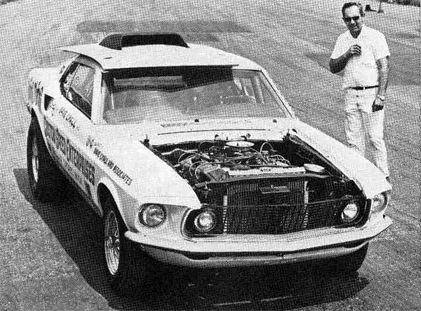 In order to legalize the Boss 429 engine for NASCAR use, 500 of the engines had to be built and offered in an available car, thus the Boss 429 Mustang was born. Because the engine was designed strictly for the NASCAR circuit, it is tailored to operate at high rpm’s. This fact can be quickly verified by checking the size of the intake and exhaust ports. They are enormous, and are generally inefficient’ at low rpm ranges. was used in the street version of the Boss, which, together with the 1969 hydraulic camshaft, resulted in a performance peak of 5400 rpm. Anything close to the 5500 rpm from the engine was inviting valve float. Remember that the engine was primarily designed for high rpm operation, but because of the cost of the lightweight valves was prohibitive for production use, heavy valves were used and thus the street engine was not capable of the needed high rpm’s and another inherent problem was created. Although Ford put a 370 horsepower figure on the street version of the Boss 429 engine, the NHRA re-factored it to SS/D, which didn’t help Ford’s chances at the drags. But the key to all of Ford’s problems with the performance cars and the thing that really put the blocks to the Boss 429 Mustang was that corporation’s Product Acceptability Standard (P.A.S.). The edict handed down from the higher-ups at Ford says that any car made and sold by the company must start when the engine is hot, start in cold weather, idle, run in traffic in fourth gear, and run smoothly at 20, 60 and 80 mph, just like a Lincoln Continental. In addition, the P.A.S. demands that the engine compartment, passenger compartment, and overall noise levels must not exceed a certain maximum. Then there’s always the performance car’s friend, the emission regulations, which are getting tighter every year. 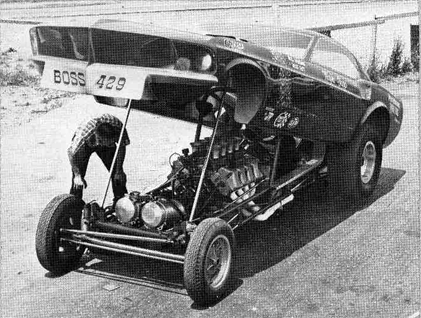 Put it all together and you can see that the Ford engineers had to do the impossible: build a production car that starts and behaves as docile as a Thunderbird, yet runs like Wayne Gapp’s injected gas Funny car. They managed to meet the P.A.S., thus the Boss 429 doesn’t make it as a muscular performer. In comparison, the 429’s drag strip competitors, especially Plymouth and Dodge, don’t have the rigid acceptability standards that serve to strangle performance. A Road Runner or Hemi Barracuda will idle a bit rougher and stumble a bit in fourth gear when you try to lug it around in traffic at 20 mph. However, step on the throttle of a 383 Dodge or Plymouth and you’ll blow any stock Boss 429 Mustang directly into the weeds. Even the 340 Darts and Dusters, let alone Chevy’s Z-28, may give the Boss a tough row to hoe. While the Chrysler and General Motors products do have certain standards they must live up to, they don’t choke their performance cars to the point where acceleration is drastically hampered. Until Ford Motor Compony loosens their Product Acceptability Standard for their performance cars, they will continue to take a back seat to General Motors and Chrysler Corporation in performance. The emission laws are one insurmountable obstacle, but there is no government legislation that says a Boss 429 (or Cobra Jet) must ride like a Lincoln. We want to see Ford improve their position and penetration in the Muscle Car market, but the higher-ups at Ford think a competitive car is one that can spin street tires on wet pavement. Until they start making and selling cars that can hold their own against the competition on the nation’s drag strips, Ford will miss their due shore of the performance pie. Above – Wayne Gapp’s injected gas funny has run low nines. Below – Dave Lyall and his respectable low-ten Boss 429.